School Sponsorship in Ethiopia, #SendMeToSchool! Every year, Roots Ethiopia re-enrolls our existing students and adds more kids to our School Sponsorship roster. In 2016, 175 kids will head to school in Ethiopia because of your incredible support. You were there when we first sent 38 kids in 2013, 70 kids in 2014, 100 Kids in 2015, and now 175! The growth is tremendous, but education in Ethiopia remains a critical need with 3 million Ethiopian children out of school. 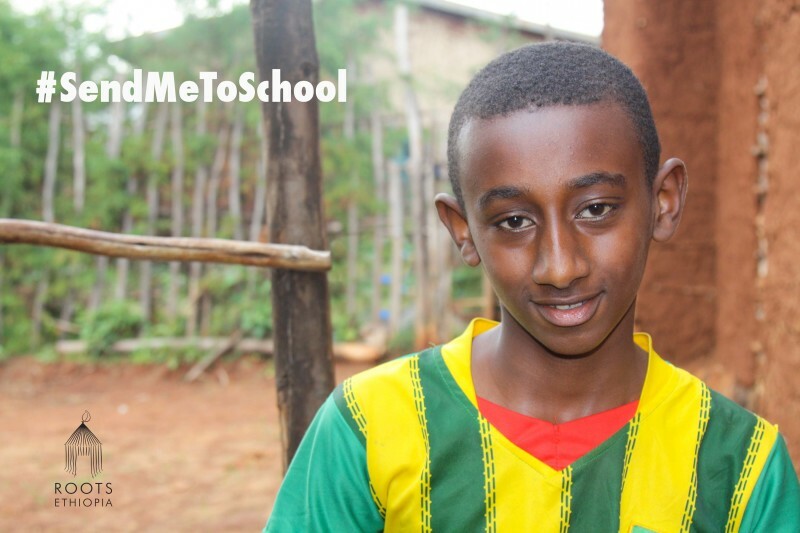 You have probably met Solomon already, the face of our 2016 #SendMeToSchool Campaign. For many of you, his deep brown eyes greeted you in your mailbox over the weekend, via our mailer! Some of you might have met him in your inbox this morning, via an email! Others are just meeting Solomon right this minute, via this blog post! Solomon is a rock star. Since joining our School Sponsorship Program in 2014, his grades just got better and better. In fact, he recently tested into the prestigious Liqua Public School, one of the top schools in Ethiopia. Our travel team went to Sodo, Ethiopia in October to meet Solomon. It was a short walk from our van to the traditional mud sided home Solomon shares with his family. It’s hard not to really feel what these opportunities mean for families in Ethiopia, so Roots Ethiopia is setting BIG goals for our #SendMeToSchool Campaign. In addition to uniforms, school supplies, a medical care allowance, and clothing, we are dedicated to making sure kids stay in school while drought conditions persist in Southern Ethiopia. All of the children and their families in our program are receiving additional food support during this critical period in Ethiopia. $21/month will send one child to school, $42/month will send two children to school, and $63/monthwill send three children to school in Southern Ethiopia.